I've always had a hard time falling asleep and actually have what I would call sleep anxiety, where if I start worrying that I won't be able to fall asleep then I definitely won't be sleeping. Now that I'm up all the time in the middle of the night, it gives me a ton of extra opportunities for that sleep anxiety to worm its way in. 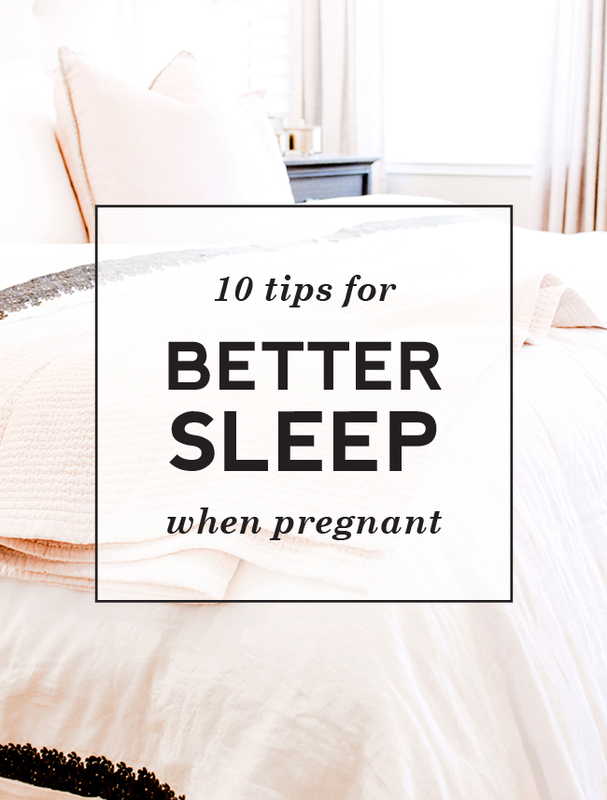 I've been looking for tips all over the place and have worked on a few methods for better sleep that I've found to work - some of them are definitely specific to being pregnant, while others will help you whether you're pregnant or not! And no, none of these are counting, breathing, or meditation tricks. My worry-ridden sleep brain laughs in the face of techniques like that. You know that article that was going around about the military's tricks for getting people to fall asleep in combat situations? Ha yeah, pretending I was laying in a canoe in a lake definitely did nothing! The only benefit to ever looking at your phone or a clock in the middle of the night is that you might see you just fell asleep. Like that's ever going to happen. Seeing how much time is left until morning will just lead to a countdown of how much time there is left for you to sleep. Instead, just always assume it's early and that you have plenty of time left until morning. I've banished digital alarm clocks from our room, and turn my phone upside down while I'm sleeping to remove the temptation. If you feel like you can't not look, try moving your phone further away from you or completely banish it from the bedroom! I promise you don't need to check your texts or notifications in the middle of the night. Oh, and if you have a husband who weirdly really likes knowing what time it is, tell him not to ever ask you to check for him during a bathroom break. Not that I'm speaking from experience or anything. I have always been an 8 hours of sleep a night kind of girl (which is probably why I still don't need caffeine in the morning!) but if I get into bed right at that eight hour mark, suddenly if I don't fall asleep right away I'll have half an hour less and then a full hour less of sleep in front of me and that anxiety will worm its way in and keep me awake. A few years ago I started getting into bed at least half an hour before I needed to, knowing that I could fall asleep early, or read or watch a show to help me relax, and it made such a huge difference. Sure, sometimes it leads to me getting 9 hours of sleep, but what's the harm in that?! Sometimes I'll get really excited about a project and work on it straight up until my bedtime (or even a little past) thinking I just want to finish one more thing. Bad idea. It doesn't give your brain enough time to relax before you're asking it to fall asleep! Inevitably you'll start thinking about whatever you were working on or running through lists of other things you need to do and wreck yourself for the night. I worked too late last week and literally woke up at two am still thinking about what else I could do for the project! Instead, close your laptop at least an hour before you want to fall asleep, and find something relaxing you want to do instead. I usually do a five minute clean up of our living room or kitchen (we call it a "quick tidy" in our house - it's amazing how much you can get done in five minutes!) and then will put on my pajamas, wash my face and maybe put on a face mask, and then read or watch a show until it's time for bed. If your brain starts going into list mode or trying to think of things to remember, it's better to get them out of your head and onto paper. That way you won't keep worrying or try to make yourself remember, and when you wake up you basically have a to-do list ready to go! I suggest a physical list rather than keeping one on your phone, since using your phone violates tip number 1! This is weird, but I've found that my body seems to sense when it's getting close to morning, and if I have to get up to pee any time after four am I'll just be up for the day. Bad body. But, now I try to go to the bathroom often at the beginning of the night and then ride on through until morning. I typically go to bed before Jeff, so for me that means I'm definitely getting up when he goes to bed, and then the first time I wake up to roll over I'll make myself get up too (and sometimes the second time too). It usually works and my bladder is empty enough that I can make it until morning! Plus I'm still tired enough that falling back asleep is easy. Man, pregnancy makes you thirsty!! I've always been a crazy water drinker but being pregnant has sent it out of control. Sometimes I get to the end of the day and realize I'm dying of thirst and chug some water before bed - never a good idea! Instead, I try to drink a lot of water right around an hour before bed, and then I'm usually set for the night. This helps keep those bathroom breaks early! If I wake up in the middle of the night feeling super dehydrated I'll let myself have a sip or two of water but never more than that. When I wake up in the morning I'm usually thirsty, but I'll just drink a glass of water right away and I'm usually set. I was really excited to buy a giant pregnancy body pillow, I think mainly because my sister raved about how much she loved hers and how she wanted a new one even though she wasn't pregnant. So I ended up ordering mine around 14 weeks (before I even announced to you that a baby was on the way!) and started using it right away. It definitely wasn't totally necessary in the beginning, but for me, it helped get me to sleep on my side instead of my stomach. What I wasn't expecting was to start experiencing terrible hip pain around 20 weeks from laying on my side. Basically your body starts loosening up your joints for eventual delivery, and your hips can actually start to be pushed out of their sockets when you lay on them - yikes! But realigning your hips, knees and ankles with something between them makes a huge difference. I was traveling a lot around the 20 week mark and let me tell you, putting pillows between your legs is definitely not the same thing - the pregnancy pillow is so much better! Mine actually isn't long enough for me to also have my ankles supported (I'm 5'9") which was actually causing more pain, so I have another regular pillow down at the end of the bed for my feet. This is the pregnancy pillow I use, I mostly love it but I think I'll write a full review letting you know some of the plusses and minuses! For me right now, that means Tums and a glass of water. I've been having terrible heart burn lately and sometimes just rolling over can cause it! Heading out to the kitchen to find Tums in the middle of the night was really waking my body up and keeping me up longer. Now, since they're right next to me, I can grab a couple without fully waking up my body and fall right back asleep. I keep a big tumbler of water next to me for the same reason. As my college roommate will remember (sorry Clair! ), this is a trick I discovered in college. Re-watching an old show (in college it was always Gilmore Girls but right now I'm on Parks and Rec) gets my brain to relax just enough to fall asleep. Basically, watching something I've seen before is enough to distract my brain from thinking about other things, but not too much to make me want to stay up to finish an episode. If I try to watch or read something new, I can get drawn in and want to keep following the story late into the night. It's actually kind of amazing, and depending on how tired or stressed I am I usually fall asleep during the cold open for a show - so within two minutes! Some people are going to pooh pooh this because of the blue light and the affect it has on your brain, but I just turn the brightness down so it isn't too much and have the volume really low. I also have my Netflix settings set up so that only one episode will play at a time, so my iPad will turn itself off if I fall asleep mid-episode. Sometimes, despite my bests efforts, I still find myself just laying awake in the middle of the night. When this happens, I just get up and leave the room. It helps you stop associating your bed and bedroom with negative sleep. I'll typically go in the living room and have a snack or read or watch a show until I feel ready to fall back asleep again. Way better than letting your mind race in bed! And usually whatever activity I pick helps me wind back down and easily fall back asleep. So there you have it, ten tried and tested tips for better sleep when you're pregnant! Is there anything you've done that helps you fall and stay asleep? I'd love to hear!